Braun’s Clean & Charge (cc) systems are probably the most popular self-cleaning stations out there. One reason for this is of course the prevalence of Braun electric shavers, but the stations themselves are useful and practical as well. And with the third-party cleaning solutions being cheap and effective, I think Braun’s stations are well worth it, particularly with the Series 5, 7 or 9 that don’t cost a whole lot more than the solo models. Incidentally, Braun stations are also the most likely to get clogged over time. The manufacturer even mentions this explicitly in the troubleshooting section of the user manual, but the directions are extremely vague and not particularly helpful. 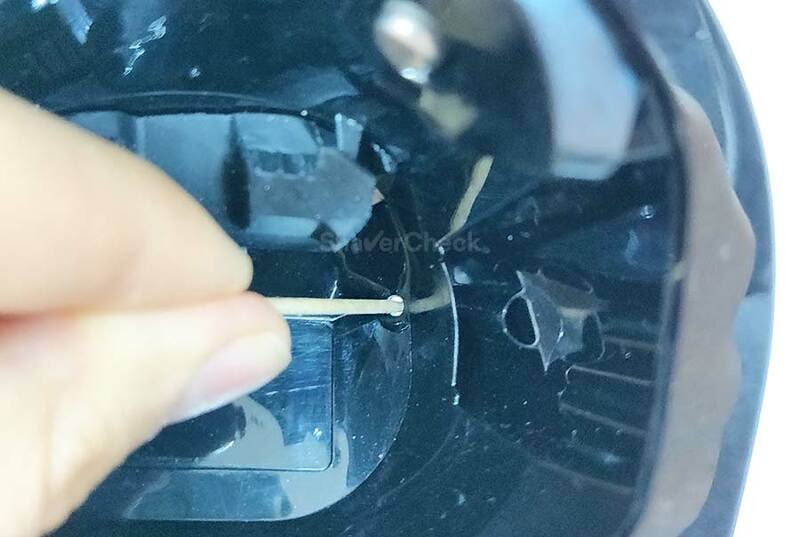 So, in this guide, I will go over how to identify a clogged Braun cleaning station and how to unclog it in a few easy steps (with detailed images). A clogged drain is the most common problem with Braun cleaning stations. While they may seem complicated at first, they’re actually pretty basic in the way they are constructed and in the way they work. Basically, the cleaning fluid is pumped from the cartridge through a tube, it passes through the shaving head, then flows back into the cartridge through a small drain hole. The bottom of the cleaning chamber is actually slanted toward the drain hole so that the fluid would naturally drain back into the cartridge by gravity alone. 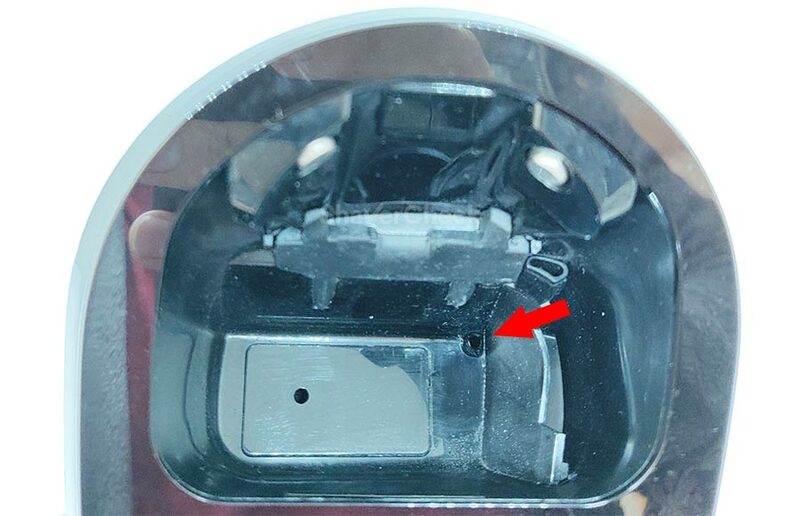 That tiny drain hole (red arrow) is the culprit for the clogging. Skin oils, hairs, dead skin and all sorts of gunk can form a plug that completely blocks the small drainage, so the cleaning fluid doesn’t have anywhere to go. If you experience some of the following situations, you’re most likely dealing with a clogged drainage. There’s an increased consumption of cleaning fluid. Luckily, cleaning a clogged Braun station is very easy and you don’t need any technical skills or special tools. 1. Unplug the power cord from the station and remove the cleaning cartridge. If there’s any liquid accumulated in the cleaning chamber of the station, make sure to remove the liquid before proceeding to the next step. 2. Locate the small drain hole. 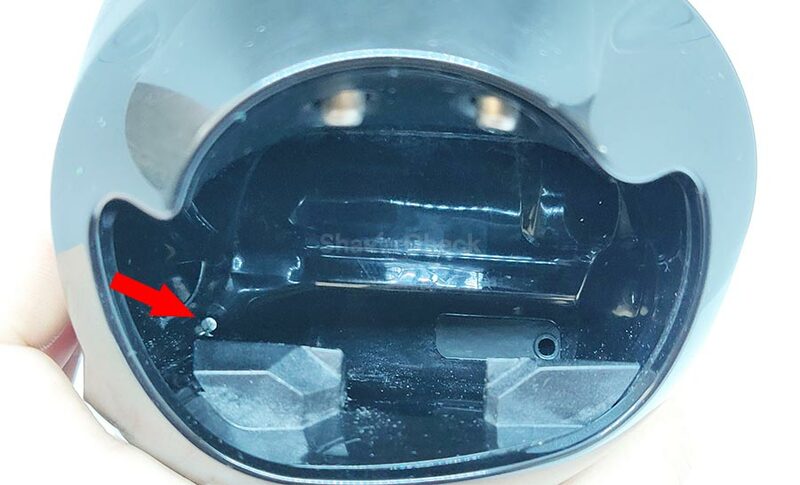 Regardless of your Braun station model, there are two holes on the inside of the station: one at the top of the sloped inner chamber and one on the bottom corner. 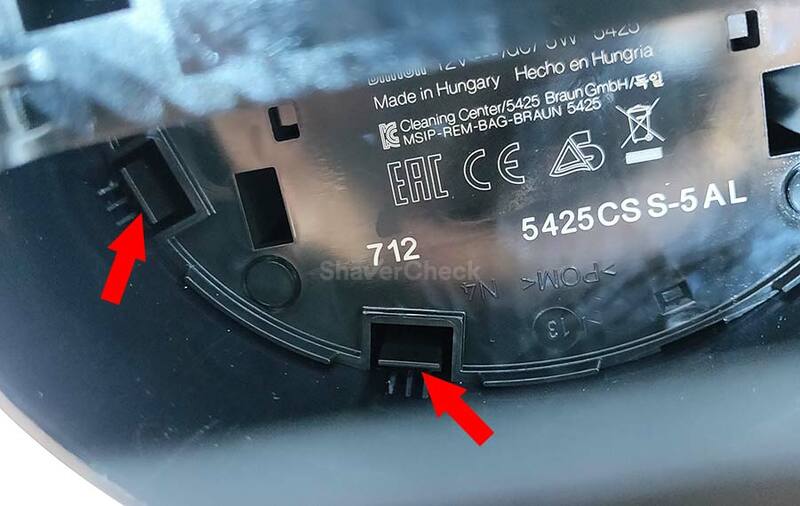 Since the cartridge has a fine mesh filter that retains all the dirt, it’s very unlikely that the other hole (at the top) will ever get clogged. The fluid enters the chamber via the hole at the top, it’s flushed through shaving head, then goes back into the cartridge through the drain hole at the bottom — that’s the one we’re trying to unclog. 3. Using a wooden toothpick or something similar, clear the drain hole. With the station open, just push any debris and gunk with the toothpick until it falls from the drainage. You should also inspect the inner chamber and clean it of any hardened dirt, making sure not to push any of it into the drain. When held at the right angle, you should be able to see daylight shining through a clean drain hole. If needed, you can turn the station upside down and clean any remaining dirt from the opposite side of the drain tube — this may be a bit difficult to perform without removing the top part of the station (see step 4 below). Optionally, you can use a bit of warm tap water and just let it pass through the drain and wash any remaining debris. 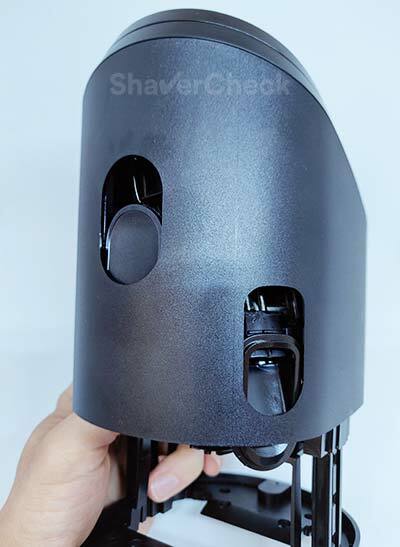 Make sure however to do it carefully and slowly, with the water flowing directly into the inner cleaning chamber — the station itself is NOT waterproof and cannot be cleaned with water. 4. 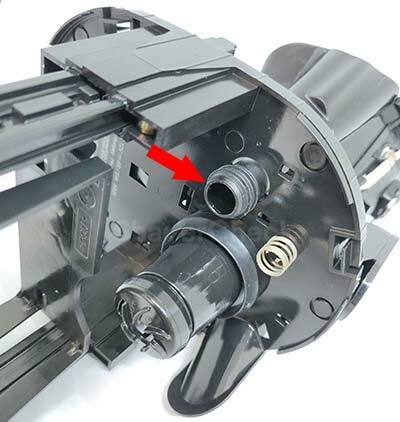 Optional: if the clogging is severe, you may need to remove the outer housing of the station to get better access to the drain tube from below. Normally, this won’t be necessary, but if there’s still some gunk that you cannot remove, here’s how to do it. Holding the station upside down, locate the four tabs that lock the housing in place. With your fingernail, gently push each tab inward. You should hear a click when a tab is unlocked. Once the four tabs are unlocked, press the button that opens the station while also pushing down on the oval part of the charging port so that they’ll clear the outside housing and the inner part will slide out. 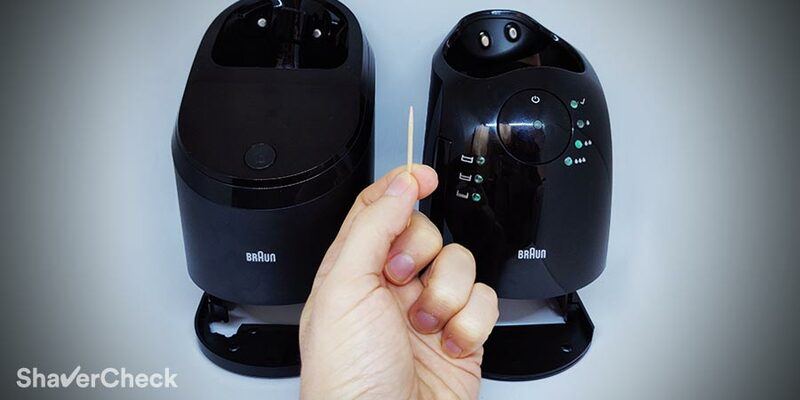 Once the outer shell is removed, locate the tube corresponding to the drain hole you just cleaned at step 3 and using the same toothpick or a q tip remove any remaining dirt from the vent. Assemble the station back in the same order, making sure to lock the four tabs by pressing them outward until they snap into place with a click. The process is exactly the same for a Series 5, 7 or 9 station. Unfortunately I don’t have a Series 3 station right now, but it shouldn’t be much different. Depending on a few factors, you may never have to deal with a blocked drain hole on your Braun station. But even if that happens and you’ll have to take matters into your own hands, the process is very easy and straightforward as we just saw. Here are a few tips to reduce the likelihood of the station getting clogged in the future. ✓ Remove most of the hairs from the cassette before cleaning the shaver in the station. Simply remove the cassette and gently tap the plastic frame on the edge of your sink to remove the hairs. You can then blow over it or use the small brush (but only on the inside of the cassette, not directly over the foils) to clear any remaining hair strands. This only takes a few seconds, but it does make a difference and will also allow you to get more cleaning cycles out of a cartridge. ✓ If you use shaving cream, rinse the head with water and remove any foam residue before cleaning the shaver in the station. Hardened lather can lead to a clogged drain probably more than anything and it can also cause pressure buildup inside the cartridge. ✓ Clean the inner chamber with a damp cloth from time to time. Fine hairs and gunk will accumulate inside the cleaning chamber and some of it can end up blocking the drain hole. ✓ Change the cleaning fluid when it becomes excessively contaminated with dirt. Even if there’s a filter inside the cartridge, some sludge may still pass through it. 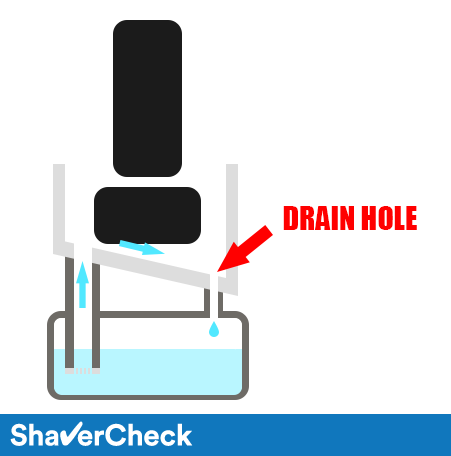 This is bad for the hygiene of your shaver and it can also block the drain tube in time. And since third-party cleaning solutions are really cheap, it’s not worth pushing it beyond a certain point. That pretty much concludes our guide. A clogged drain is by far the most common problem with Braun stations, but luckily one that can be easily fixed. If you have any further questions or simply want to share your experience, make sure to leave a comment below. 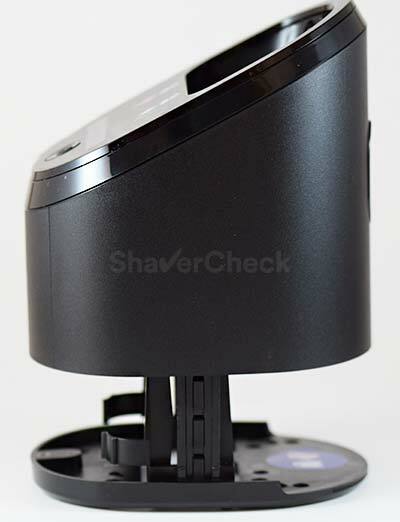 Disclaimer: shavercheck.com and the author of this post are not responsible for any damage caused to your device.